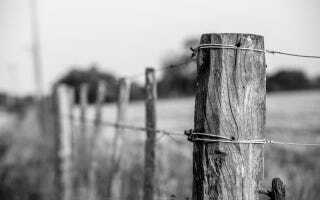 Before Ma Bell came to town, and long before DSL, it was barbed wire, of all things, that brought rural communities together. A Sears telephone hooked up to barbed wire—miles of which were already conveniently strung along fences—connected far-flung ranches in the recently settled American west. Thus an ingenious and unregulated telephone system sprung up a hundred years ago. More than just physical wire differentiated these rural telephone systems and their more formal urban counterparts. Without switchboards, without individual lines, and without telephone fees, the barbed wire telephone system became its own social network. Today, we might see elements of "personalised ringtones, chat rooms and online music" in this telephone network, as Bob Holmes writes in a feature at New Scientist. Since the system had no switchboard, every telephone along the fences would ring at the same time. Each house had its own distinctive ring—two short one long, for example—and it was considered impolite to listen in on another's call. Of course, when things got lonely out there on the ranch, there was no guarantee of privacy. Talk was free, and so people soon began to "hang out" on the phone, just as they do today in online social networks. "People would read the newspaper over the telephone," says MacDougall. "They'd have musical nights where someone would play their banjo, someone else would sing along, and others would listen." The shared line could even serve as a rudimentary broadcasting system. On many fence-phone networks, a single, very long ring would signal a "line call," an announcement of interest to everyone on the system. This might be a weather report, weekly livestock prices, word that the train would arrive late, or news of an emergency such as a prairie fire. In its heyday, these independent telephone networks supposedly included 3 million people, more than the official Bell system. Sometimes the rural systems became more sophisticated—a switchboard, for example, might operate out of someone's kitchen—but it worked remarkably well in its simplicity. Before Prohibition came in 1919 every town had at least one saloon and most had several. Saloons discarded bottles—beer bottles, whiskey bottles, wine bottles. You name it, if it came in a bottle and could be consumed for pleasure, saloons stocked it and, when the bottles were empty, discarded them. Glass is one of the best electrical insulators there is. Bottles were collected from behind the saloons, the necks were broken off, wooden pegs were whittled to fit into the broken bottlenecks, holes were drilled in the pegs, and the "glass insulators" were nailed to fence posts.